I may be used to getting something different from CLAMP every time they produce a book, but it's still impressive. True, Suki. Dakara Suki. (abridged slightly to just Suki for this release. The full title can be translated as "I like you. That's why I like you.") is a love story, like so many other CLAMP works. Hinata Asahi, the main character of this tale, is also reminiscent of other CLAMP heroines. She's small of stature, but possesses an indomitable spirit - a love for living - that makes her very charming. There's even a tall, dark love interest (also a CLAMP staple), personified by Shiro Asou. Asou is Hinata's new neighbor, and coincidentally, he's also her new homeroom teacher. Despite the age gap between the two, the innocent Hinata is nonetheless attracted to the man. Hinata is smart when it comes to school and talented in an athletic setting, but not too bright in real-world interpersonal relationships. By the end of this first volume, I'm not entirely sure whether Hinata's high spirits will rub off on Shiro, or if she's setting herself up to be hurt - at least emotionally - when the older man fails to return her affection. That uncertainty, the feeling that not everything is as it seems, that there's more to this story than what the first few chapters reveal, is perhaps the most appealing feature a CLAMP story has to offer, and so far, I can feel it lurking in the shadows of Suki. CLAMP is one of the best-known (and best-loved) groups of manga creators in the world, and while there's still much more to be uncovered before I can truly pass judgement on this book, it looks like this series is going to be one of their better ones. Sometimes, the artwork for a particular series alone is enough to make us want to read it. Despite having an overall similarity to character designs from other CLAMP productions, Suki looks noticeably different from some of their earlier stuff. 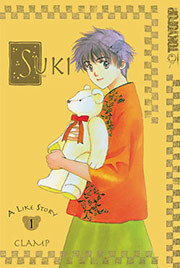 Like Shirahime Syo, the look of this release is more realistic than Angelic Layer, CLAMP School Detectives, or Rayearth. There isn't an army of characters, so the people who are presented are all very distinct from one another. Hinata is almost boyish in design, while her friend and classmate Touko is one of the prettiest characters CLAMP has created in recent memory. Asou looks more Japanese than his equally tall and dark counterpart in Wish, and there aren't even too many instances of comedic exaggerations. Every once in a while, you'll see ears on Hinata, or she'll be illustrated to look like a monkey, but that's just the kind of character she is. Everyone else maintains a steady appearance of realism, grounding this story a bit more solidly than others. In my opinion, TOKYOPOP found the secret formula for printing the perfect domestic book, and this volume doesn't stray from that tried and true standard. If I had to ask for anything, it would be sound effect translations in the back of the book and perhaps supplemental background material regarding the making of Suki, but this is fine the way it is. The localization is well done, and reads smoothly. Changes to the typeface (such as italics, boldface, and size alterations) are used to note differences in emphasis in the text, and frequently even these parallel their Japanese counterparts. Overall, this story might not contain the action or drama you're looking for just yet, but it has potential. We'll just have to see if I'll go from liking to loving this title. From that perspective, I guess the title is appropriate.